mouse over the bus for details. may not work on all browsers. It is thought the photograph was taken in College Street, Belfast. David Lawther served in a Royal Navy armoured car squadron in the Caucasus during the 1914-18 war and had been running buses between Drumbeg and Belfast via Ballylesson since 1925. In 1928 he was providing eleven double workings over this route as well as running to and from the hospitals on visiting days. 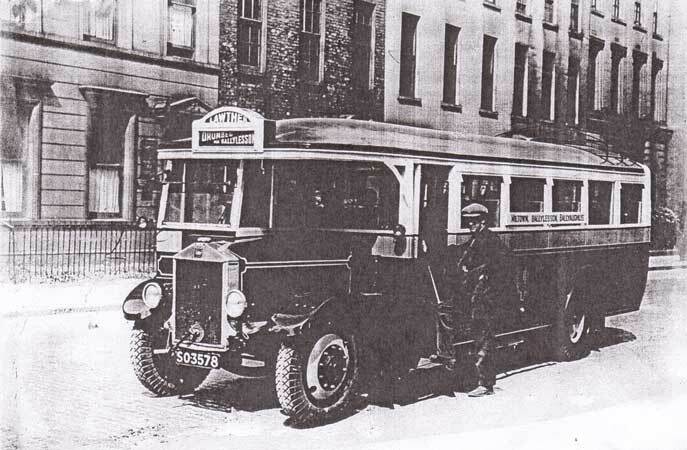 Over the next seven years he built up his business so thet, when he was taken over by the NIRTB he was the owner of eight buses ( 1 Albion; 1 Chevrolet: 3 Commer; 1 Dennis; 1 Leyland; 1 Reo).